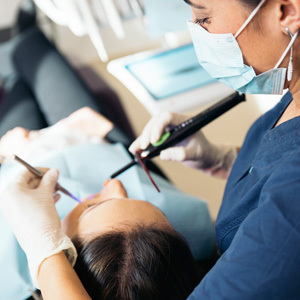 Regular dental exams can help prevent serious dental problems. Preventative care visits are essential to maintaining a healthy smile. Healthy patients should have their teeth cleaned and examined every six months in order to encourage healthy smiles and address oral health problems while they are smaller and simpler to correct. Preventative dental care is essential to maintaining a healthy smile. During these visits, we will complete a thorough examination of your teeth, gums and other orofacial structures. Our dentists will inspect the health of your teeth and the integrity of existing dental work. We may advise you to have x-rays done to further assess the dental and supporting bone health. If X-rays are necessary, we will take those at this time. Digital x-rays use reduced radiation levels and allow us to pinpoint areas of concern before they are visible clinically. Scaling of the teeth could be planned on the same visit, which would be followed by fluoride application. Scaling removes plaque and tartar off the teeth and helps to maintain healthy gums. Concentrated fluoride gel application helps in prevention of tooth decay. We will clean your teeth above and below the gumlines to eliminate plaque build-up, tartar and stains. Having your teeth regularly cleaned helps to prevent periodontal (gum) disease that can cause major dental problems, including loss of teeth. We will also review oral hygiene methods with you that will keep your teeth stronger, longer. A thorough soft tissue examination will detect changes in the soft tissue lining of the mouth, cheeks, floor of the mouth and tongue. Early diagnosis of precancerous and abnormal tissues is essential for effective treatment, as most oral cancers do not cause symptoms until they are very progressed. We also perform a periodontal screening to check your gingiva for any sign of gum disease. It is important to detect gum detachment in its earliest stages to achieve the best results, as periodontal disease is the #1 cause of tooth loss.